ScotRail customers will be able to travel on the first new Hitachi class 385 electric train this week, the rail operator has announced. 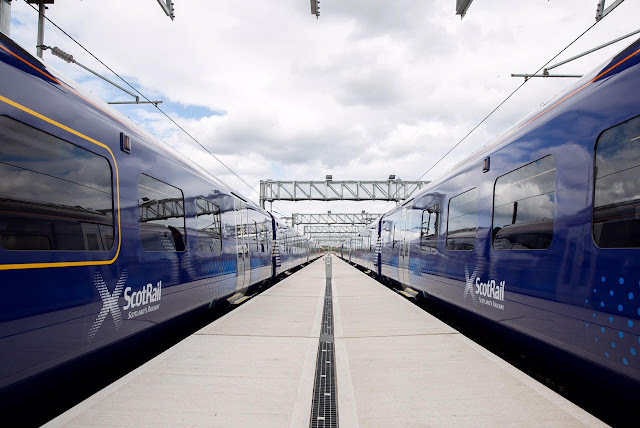 The first of the class 385 Express trains will run on the Glasgow Queen Street-Edinburgh Waverley via Falkirk High route from Tuesday, 24 July. The remainder of the new class 385 trains for that route will be phased in over the course of the coming months, before the rollout is extended to other routes across the Central Belt. The new Hitachi trains are part of ScotRail’s £475 million rolling stock investment, following the £858 million electrification of the line between Edinburgh and Glasgow by Network Rail Scotland. Extended platforms at Glasgow Queen Street and Edinburgh Waverley to accommodate longer trains. ScotRail recently introduced class 365 ‘happy’ trains between Glasgow Queen Street and Edinburgh, which boosted capacity by more than 17,200 seats a day. “I am delighted that customers will be able to travel on our new Hitachi class 385 electric trains from next week. This is a significant moment as we work to build the best railway Scotland has ever had. “It’s great to see the investment in the class 385 fleet come to fruition with their imminent entry into service. This is another example of partnership working to help make Scotland’s railway the best it has ever been. “When passengers step on board this first train they’ll find it light, spacious and modern with loads of more seats – up to 130 extra compared to the existing diesel trains. Hitachi is building 70 new class 385 trains for ScotRail. This will deliver 234 carriages, made up of 24 x four-car trains and 46 x three-car trains. Four-car trains have 273 seats, with a total of 546 seats for eight-car trains. Three-car trains have 206 seats. Less energy is required in operation – the class 385 trains are 18 per cent more energy efficient than the diesel trains they will replace. Reduced noise pollution for those living and working near the line. No CO2 emissions from the trains. CO2 is produced at the source of electricity, so cleaner air – resulting in a 21 per cent reduction in the CO2 footprint. Later this year Hitachi Rail will manage and employ 250 staff at Craigentinny depot as part of the 27 ½ year maintenance contract. Scotland’s busiest and biggest depot will become Hitachi Rail’s maintenance and training hub in Scotland, where Hitachi’s Class 385 and LNER Azuma train will be serviced. Managing Craigentinny is part of the wider investment in Scotland, which includes £20 million upgrading depots in Aberdeen, Inverness and Glasgow so they can maintain modern Hitachi trains.